What are the major changes in the new system? Dubbed the 'cloud OS' the new feature set of Windows Server 2012 is has been described by Satya Nadella, President of Microsoft Server and Tools Business, as representing "a renaissance in the new world of continuous cloud services, connected devices and big data". Businesses that have deployed servers and are using cloud based installations – perhaps using Microsoft's own Windows Azure – will welcome the extensive support for further virtualisation with the new release. But the Windows Server 2012 feature set goes much further than this, with hundreds of improvements that can be exploited. Dell recently announced that its PowerEdge 12th generation server would "optimise the dynamic virtualisation infrastructure that Windows Server 2012 Hyper-V provides to scale and secure workloads, cost-effectively virtualise their data centre, manage infrastructure efficiently, and build cloud environments." In addition, IT managers can take advantage of the Dell DVS Reference Architecture for Windows Server 2012. It offers an end-to-end solution for virtualisation that includes using App-V, and a choice of remote desktop services and virtual machines that are all configured, deployed and managed from a single console. Windows Server 2012 also includes Hyper-V 3.0 that now allows live migration including the attached storage. As data integrity has become even more important on server deployment, Windows Server 2012 has made a major change in this area that Microsoft call Resilient File System (ReFS). This updates the ubiquitous NTFS to a more robust file format aimed at reducing the instances of corruption. "Windows Server 2012 was built on the foundation of Microsoft's deep experience with very large cloud data centres," said Mike Schutz, General Manager, Product Marketing, Windows Server, at Microsoft. "Dell's 12th generation PowerEdge servers take advantage of Windows Server 2012 breakthrough capabilities across storage, networking and virtualisation. "Dell offers innovations such as the Dell Converged Blade Data Centre for mission-critical Microsoft workloads." 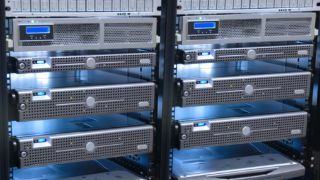 Improved storage is also a major component of Windows Server 2012. Server Message Block allows IT managers to buy cheap commodity disk drives and use these with their servers to deliver high performance. Also, clustering is possible with ReFS able to address 256 zettabytes using 16K clusters. PowerShell also receives an upgrade to version 3.0. System Administrators will welcome the 2,400 cmdlets within automation scripts and Windows Workflow Foundation, which makes it possible to take tighter control of the server. In addition, the 'always available' promise has been delivered with new cluster management and shared volumes that enable updates and patches to be run without rebooting.